3. Run rFactor, select Masters F3 and enjoy! 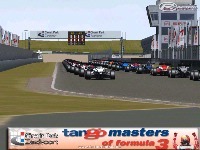 There are currently no setups for F3 Masters 2009. Add a Setup. There are currently no car skins available for F3 Masters 2009. If you are a painter you can share skins for this mod via the Car Skins area. Visit the Spray Booth for painting tips & tricks. I don't use any download site, any easier way??? I really all your F3 mod,love to try them all . Any good free download site or can it send by email ??? I can't download any of your Mod,It said service no available at my area. So where can I dowload all your new F3s Mods????? there is only 1 old car? ?